One of the biggest struggles I found in myself when going through depression is that we are always stuck at a crossroad. We tend to doubt our path a lot and with doubt we become so indecisive and can’t make realistic and rational decisions for ourselves. Why are we stuck at a crossroad? Most of the time, it’s because we lose track of our purpose and don’t know who we are. Knowing who you are and knowing what your purpose is goes hand in hand. But, without knowing who you are, you’ll never find your purpose. People say that it might take you years to find your purpose. That could be true, but in order for you to find your purpose, you need to know who you are first. What you like, is what you like…not who you are. At my old job one of the directors asked me a simple question when I broke down to him. He asked me just one question, and to me it ended up being the most important question you’ll ever have to answer in life. He asked me, who is Simrat Ghuman? And he was right. I never had anyone tell me that the purpose of your life is something that will be standing side by side to who you are. Everyone will tell me that my purpose in life should be something I enjoy doing, a passion, something I love, something that will make me happy. But it’s all wrong. The purpose to your life is who you are. The moment you find who you are, your purpose, your life, everything else will come into play and place themselves perfectly and accordingly afterwards. Took me months after our conversation to figure out who I am, and later I found my purpose. How did I find the answer? I meditated. I spent 30 minutes every morning ever since my conversation and day by day came closer to a better understanding of myself as a person. I understood myself. I understood why I was going into depression 13 years ago. Because I didn’t know my purpose, I didn’t know who I was. That was my second struggle. My second fall in depression. I am a healer. My purpose is to inspire those that are going through what I have gone through. My purpose is to guide those that are still in the dark because darkness is all I have ever known myself. And this will always be my purpose till the very end because that’s who I am. It’s a struggle. We may think we have everything figured out in our life. We think what we are doing now is what I’m supposed to do in life. We think we are meant to work our 9 to 5 and be done with it. We are meant to be stuck in an office yet you dread it and you’re wanting to be outdoors, or wanting to be around people. You feel you want more. You feel you need more. You feel there is more out there for you. You feel you’re better than what you’re doing now. You’re right, you do need more, because what you’re doing now is probably not who you are. What you’re doing now is not your purpose. You’re never going to be happy this way. But with all that, with all you do with your life day by day, why does that trigger depression? Because, who are you, really? Try meditating with candles. I have always encouraged the energy of candles. They help you a lot with meditation when doing so. When you’re sitting in your room before meditation, light a royal blue or a light blue candle and focus on the candle as you breathe. Slowly you will go into a calm state of meditation. Once you are in meditation you’re going to find answers to your life than ever before. You will find who you are, and you will know your purpose. The energy of candles are strong, when you find the right royal blue or light blue candle when going into meditation for finding who you are and the meaning to your life, you’ll see. Again, this also takes time. You probably won’t go into a meditation state the first time. You must breathe slowly and put your energy onto the candle. Your mind will never shut off, nor should you force it to. Just focus on the candle. Do this every day, slowly but surely, you’re going to get there. Doesn’t matter when you meditate, the hour of doing is not important, the doing is. When done, don’t blow out your candles, snuff them out instead. Remember, there is a big difference to the meaning of life and the purpose of yours! Next time you are stuck at a crossroad, park at the sideline for a moment and ask yourself, who am I, and once you’ve figured that out, the crossroads just become smaller and smaller. 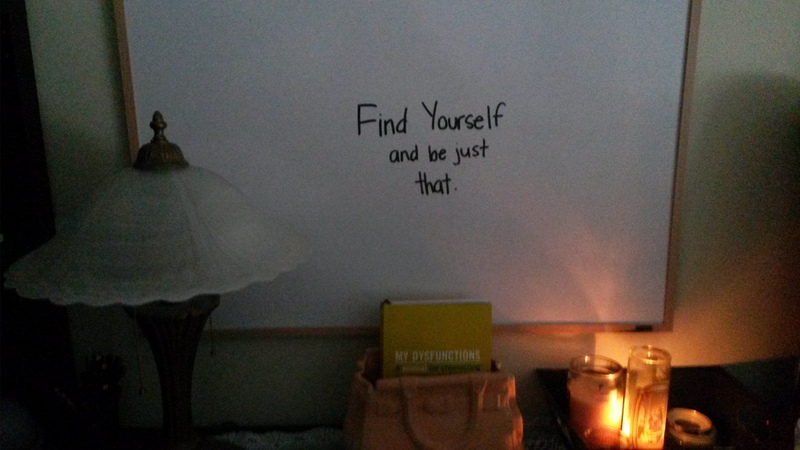 As my inspirational white board in my room says: Find yourself, and be just that.